NCA Outrigger at the Liberty Challenge. 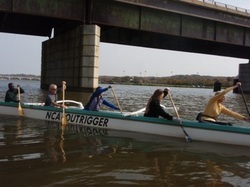 Outrigger canoeing in Washington DC brings people of a multitude of generations and backgrounds together. 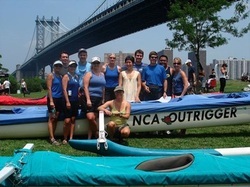 Outrigger Canoeing, sometimes called "OC," is a team oriented sport that doesn't require any previous experience on the water, just a desire to experience the "Aloha" spirit and spend time exercising with a great group of people of all skill levels who enjoy experiencing DC in a wholly different way (on the water!). Outrigger canoes seat six people. We work as a team to race in multiple events in DC and throughout the East Coast (e.g., NYC), while also competing in major events in Hawaii, California, and other areas of the world. Come on out! We hope you give it a try! Dozens of paddlers have joined us, and we hope you do as well! We are a club, with members from multiple walks of life, all age groups (paddlers from 16-70s), with varied backgrounds. Some of our members run marathons, kayak, bike, hike, crew, and many hadn't participated in team sports in decades. Our members work in all sorts of walks of life, from lawyers to non-profits, from consulting to military service. National Capital Area (NCA) Outrigger traces its roots back into the mid-nineties, bringing the traditional Hawaiian sport to a the DC metro area. NCA Outrigger now has established men's, women's, and co-ed teams and looks to develop youth teams sometime in the near future. Though outrigger canoe has an integral place in the Polynesian culture - it was declared the National Team Sport of Hawaii in 1986 and has been widely practiced in Hawaii and California since the 1950's - it has only recently blossomed as a sport on the East Coast. In just the last several years, the outrigger racing circuit has grown to extend from Connecticut to Florida. Sign up / Show up! ​Note: all guests must sign our ACA Waiver before practicing!